About UsWant to know what we do? Monthly recomendations continue, a few days late but we’re still here! 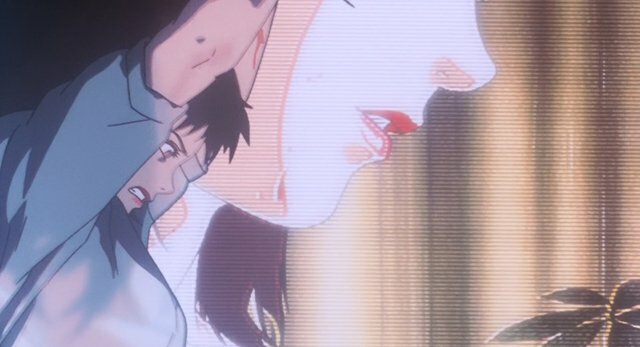 Each month, we’ll be asking someone to pick out an anime, cartoon, comic, manga and webcomic that they love and think everybody else should check out. This month it’s me, Reaf, regular Anicom contributor and person who spent too much time watching Person of Interest rather than writing these recommendations. 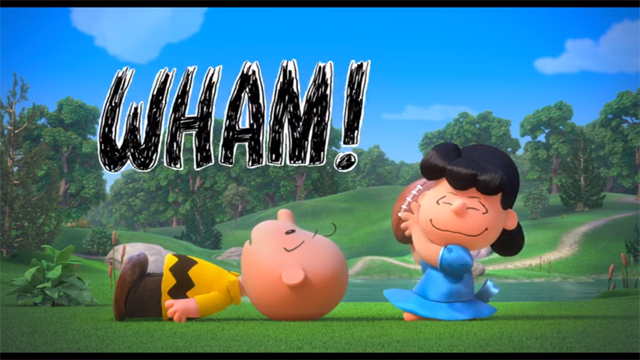 Since Suicide Squad is coming out soon and it’s reviews are not particularly good, in fact they are downright awful, so here’s something good to watch that has the Suicide Squad. 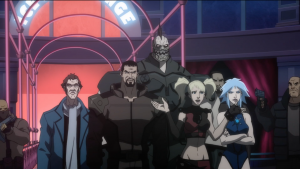 While this animated movie is called “Batman Assault on Arkham” that’s just there for marketing purposes, it is a Suicide Squad movie that has a Batman plot running alongside it. The plot is that the head of a government black ops division, professional hardass and badass Amanda Waller, needs to retrieve something the Riddler has stolen from her. Problem is the Riddle has just been locked up in Arkham Asylum. 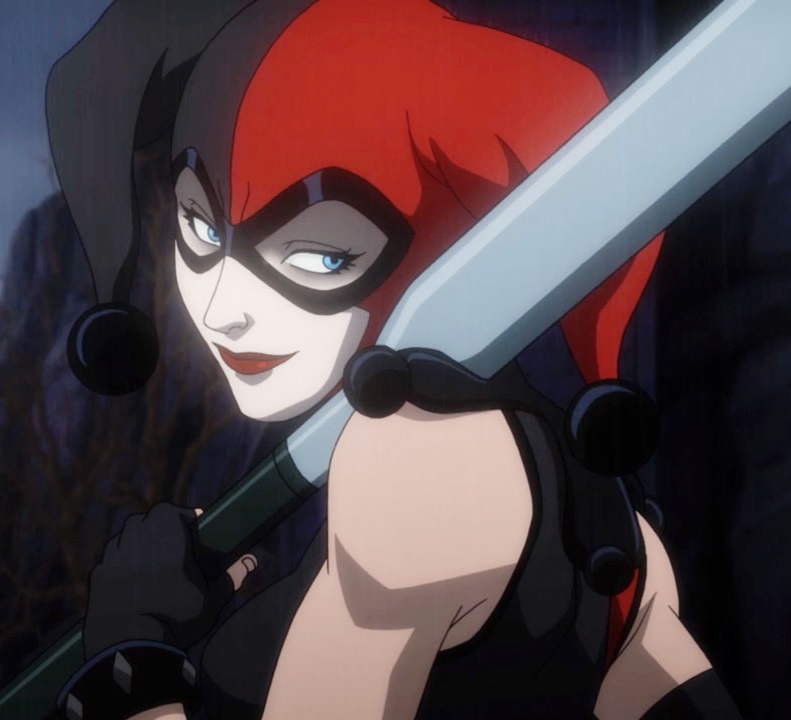 So she assembles a group of super-criminals to break into Arkham and retrieve what the Riddler stole, anything goes wrong and the criminals take the fall. And there’s also a plot of Batman trying to find a bomb the Joker planted somewhere in Gotham. It’s a group of criminal misfits being forced to work together, their personalities clash, it’s loads of fun. 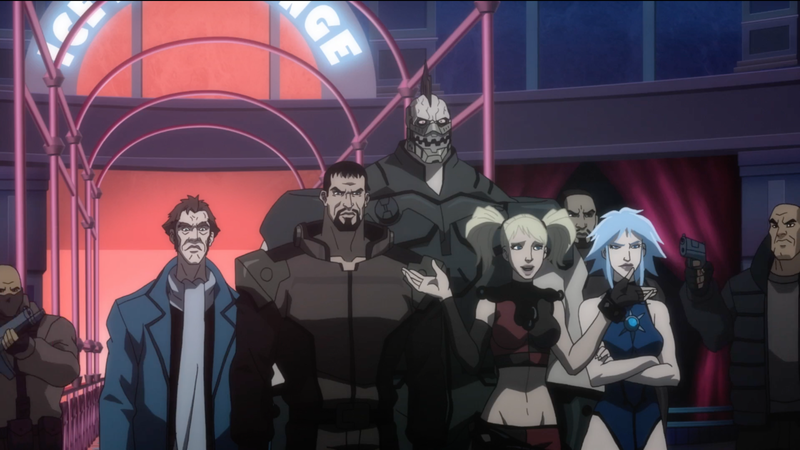 It’s got some of the same Squad members as the live-action movie, notably Harley Quinn, Deadshot, and Captain Boomerang, but also has some others because that’s the fun of the Suicide Squad. Lots of less well known villains, some of which do die, and you get to see some of the cool crazy characters that usually don’t get the spotlight. It has its flaws, I thought the twist made the movie a little less interesting and more bog standard, and it is set in the Arkham game continuity so it shares the rather abysmal art and character design trappings. But compared to the live action movie these character designs seem pretty good now. It’s a good little movie to watch and it currently sounds preferable to the big budget live action movie coming out this week. You can watch it online here or buy it here. 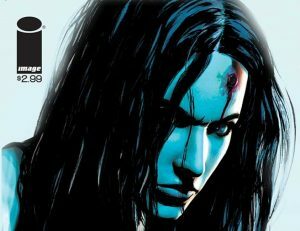 Lazarus is the comic equivalent of Children of Men meets the Godfather. Great dystopian fiction that has a perfect blend of political and social commentary with a fantastic sc-fi thriller trapping and stylings. In it the world has changed and the 1% have become the 0.1%, the world isn’t controlled by nations but instead by ‘Families’ much like the organised crime families. Each family has a Lazarus, a person genetically and technologically augmented to defend them and fight for them, if they die then they get back up again to finish their job. The main family we follow is Carlyle, and their Lazarus is Forever, and she beginning to find out what the Carlyle family have been keeping from her. This is an Image comic, written by Greg Rucka and drawn by Micheal Lark, and it has this great thriller aspect that is so masterfully done that it makes it hard to stop reading the comic. You want to read more, see how the story plays out, and then pick up the next book to see it continue. It’s the infectious thriller. It is just full of fantastic characters and world-building that each new chapter opens up a new aspect of the story and its world. It’s still ongoing, and there can be a delay between issues, but it’s well worth the wait. 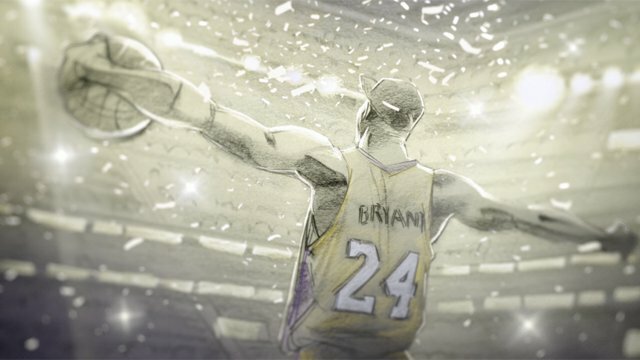 Since it’s an Image book it will usually be in one of the big Image sales on Comixology. You can read it online here or buy it here. 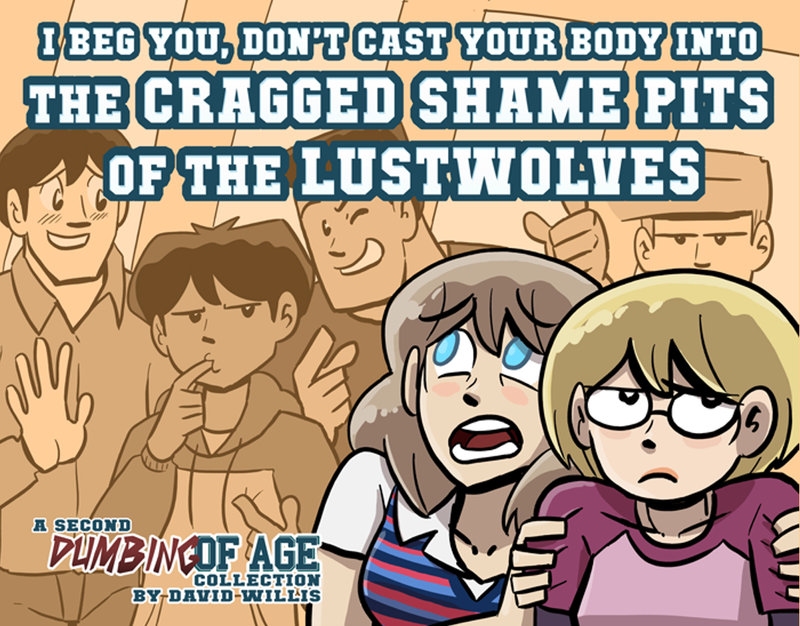 Written and drawn by David Willis Dumbing of Age is a college slice of life daily webcomic with a cast of thousands. 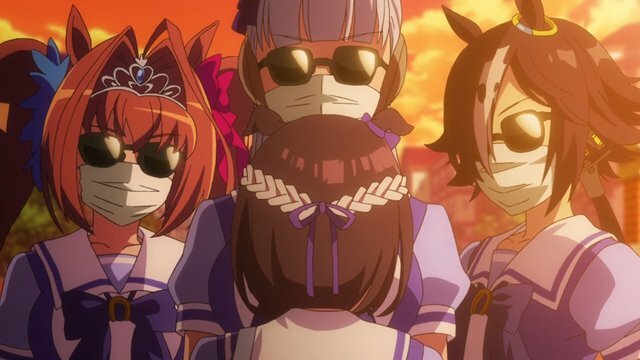 From a Christian fundamentalist seeing how things are outside her home town, to Atheist journalists with presidential aspirations, to an incredibly introverted girl who loves dinosaurs, to a superhero with crippling emotional issues, and a cool biker girl who caused said crippling emotional issues. There’s lots of different people at this college, and so much drama. Willis has created many other webcomics and has brought all the characters from those into this college AU, but thankfully you don’t need to have read all those other webcomics to understand everything. He mostly seems to pull from his own college life and craziness. He was raised as a Christian fundamentalist and so he adds a semi-autobiographical nature to this, plus lots of first hand accounts that means yes all the “crazy Christian” stuff is actually things he has experienced or was raised to believe. 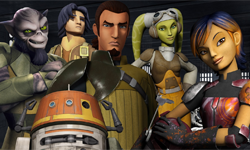 The current storylines include a lesbian suicide pact with the dorm RA, the cast trying to hide a homeless girl who got kicked out by her father for being gay and her father than came to take her away at gunpoint (which also involved a dramatic car chase), and a confused bisexual love triangle (of sorts). There’s a great mix of comedy and wonderful drama, sometimes of the soul crushing variety. Plus lots of gay, lesbian, asexual, bisexual, transgender characters, and a whole lot more. 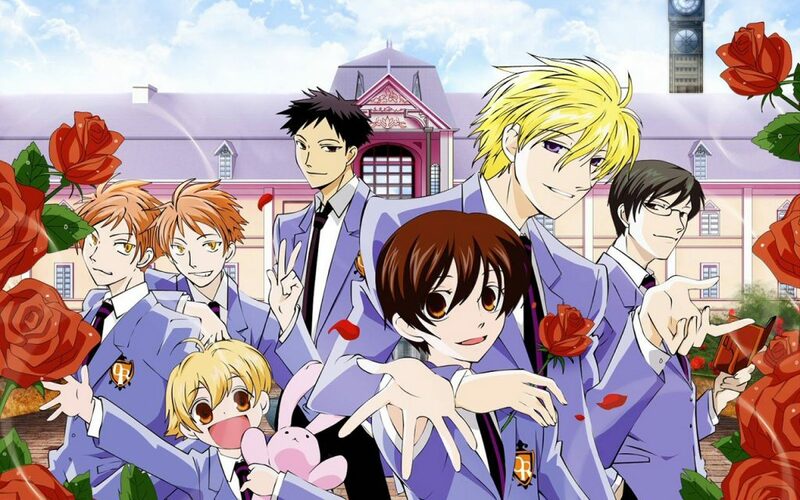 One of the good funny wacky comedy Anime’s Ouran Highschool Host Club is probably the best example of the genre. The plot is that Haruhi is a scholarship “commoner” student at the wealthy and prodigious Ouran Academy, who one day accidentally breaks an expensive vase of the Host Club. So the Host Club force Haruhi to work off the debt by becoming a Host, someone who swoons and charms their female guests, and they find out Haruhi’s a natural at it. They also find out she’s a girl and not a boy like they (well most of them) originally thought. So now they have to keep up the pretence that Haruhi’s a boy while also indulging in every whim they can think of. This is a very quick witted comedy with also lots of slapstick and crazy situations. Everyone in Ouran Academy is from a wealthy family, except Haruhi, and pretty much most of the Host Club antics can be summed up as “goddamn rich people” and it works. It’s lighthearted fun with sly humour and cute gender politics. Recommended for anyone who wants a quirky comedy that’s clever, cute, heartwarming, and doesn’t feel the need to be disgusting or antagonistic for cheap laughs. One of my favourite animes. 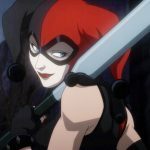 If you want to read more stuff from me you can check out my blog here, I’ve just done a review of the latest DC animated movie Batman the Killing Joke. For all our past recommendations, click here!